It was a still spring morning. The kind of morning that makes you yearn to be lazy. To languish in the comfort of your home while sipping coffee outside and smelling the morning ocean breeze of the Palisades, salt mixed with night- blooming jasmine. How I wish I could be lazy. Just once. When my alarm clock goes off at 5:03 a.m. (I always set it for an odd number), it’s like a starter pistol for my day—assuming I ever went to sleep in the first place. school. My only hope was that there would be no accident so I would at least stand a chance of getting to school before they were singing the good- bye song under the good- bye tree. If there was to be a motor vehicle accident that day, perhaps it would be between two organ donors so that the whole day wouldn’t be a wash.
middle finger of his free shifting hand nearly struck me. Multitasking at its best—and worst. I careened out of the way, missing him and the joggers and bicyclists along the side of the road (don’t those people have jobs?). In the process, however, I spilled my coffee, which I had been balancing between my thighs (a trick my husband taught me), all over my lap. My entire car smelled like coffee and my thighs were on fire. Great. What else could go wrong today? BEEP! BEEP! BEEP! BEEP! BEEP! BEEP! BEEP! BEEP! catheterization lab, or cath lab as we call it, which is where patients get an angiogram to look for blockages in their coronary arteries. It is a place of pain and discovery for me and the patients. Thankfully, I was just pulling into the parking lot of the hospital when my pager went off. The call was about a female pediatric patient who was having a heart attack. Pediatric, by my standards, is a patient in their thirties or forties, since most of our cardiac patients are well into their eighties and nineties. She was having a cardiac arrest, meaning that her heart had ceased to beat, and she was undergoing CPR. Any other information about her was irrelevant to me, including her name. I needed to get to the cath lab stat and further information over the phone would have just delayed me, as I can sprint from the parking lot faster with the phone on my belt clip than at my ear. Little did I know at the time that I would have the next three months to get to know everything about her and her family. Dorothy was a vibrant forty- seven- year- old woman who successfully balanced raising six children while holding down a full-time job as a nurse for a gastroenterologist. She carried stress around like an American Express card. She never left home without it. It was her constant companion and she learned to just “live with it.” It was simply woven into the fabric of her being. For several months, she had been experiencing indigestion—a gnawing pain located in her upper abdomen, which was worsened by stress and relieved with rest at night. Recently, however, she was even waking at night with indigestion and kept a constant supply of antacids at her bedside, which she chewed like candy throughout the night. She told the gastroenterologist for whom she worked about her symptoms and he said, “It’s probably an ulcer caused by stress. You should have an endoscopy to check it out.” When all you have is a hammer, the whole world looks like a nail. She was admitted to the hospital the following week for an upper gastrointestinal endoscopy—a simple outpatient procedure that uses a scope to look at the esophagus, stomach, and proximal small intestine. The gastroenterologist felt that as long as she was having an upper endoscopy, she might as well have a lower endoscopy, or colonoscopy, during the same appointment. It would be a waste of time and anesthesia not to check for colon cancer. will die from cardiovascular illness. Put another way, if you are reading this book and there is a woman seated on either side of you, look to your left. Look to your right. One and possibly two of you will succumb to heart disease. The American Heart Association estimates that one woman in the United States dies every sixty seconds from cardiovascular disease. In other words, the widow maker prefers women. Dorothy was rushed to the cardiac catheterization lab for an emergency angiogram to evaluate the status of her coronary arteries—the arteries that bring life- giving blood to the heart. During an angiogram, dye is injected into the arteries and traces the path of blood flow. Like a road map, it reveals where the blockages are. And there it was. The widow-maker lesion that causes a blockage in the main artery of the heart that essentially eliminates blood flow to the entire front and left side of the heart. Death takes on many forms, great and small. In this case, death was a three- millimeter collection of calcium, fat, and platelets beyond which no blood flowed. By the time I arrived at the cath lab, Dorothy had arrested three more times. From the viewing room just outside the cath lab, I watched the team work to resuscitate her with the same efficiency as a NASCAR pit crew. Clear! Shock. Chest compressions. Adrenalin injection. Breathe. Repeat. And so the battle goes. While I watched the resuscitation, I was faintly aware of two things: the pungent smell of the coffee I had spilled on my lap and the scent of charred flesh from the voltage being passed through her skin. The combination smelled like roasted marshmallows whose edges had been singed by a Lake George campfire. The cardiologist who had performed the catheterization approached me in haste. Sweat formed on his upper lip and brow. He had been working hard to save her. spilled coffee. Now, to answer your question, yes, surgery is an option here. It’s her only option.” At this point it’s fair to say that, in general, I can be a very blunt person. Comes with the territory. The look of relief on his face changed his whole demeanor—from tense and apprehensive to relaxed and comfortable in his own skin again. Someone would save her when he couldn’t. Medicine is always like this. We work as a team. We run a course of treatment, and when that course is exhausted and doesn’t work, we hand the baton to another doctor with another course of treatment to run a different leg of the race to save a life. And we do this one life at a time. It was while Dorothy’s life hung delicately in the balance before my eyes that I decided that surgery was her only hope of survival. Without surgery, she would die. With surgery, she had a small chance. But it was better than no chance, and it was not time to give up. Not yet. With one hand I picked up the phone and called to the OR to get a room ready. With the other hand, I grasped the closest railing of the bed, unlocked the bed’s brake with my foot, and started moving the patient single- handedly and singlemindedly toward the door of the cath lab. “Pack her up, we’re heading to the OR!” I called to the pit crew of nurses and techs. Sometimes actions speak louder than words, and when they saw me start moving the bed, they were on board with my plan. As I said: firm grip, confidence. The team knew exactly what to do. Someone took over the ambu bag and squeezed it to breathe for Dorothy while we transported her. Another tech threw the portable monitors, IV bags, and tubing as well as the defibrillator onto the moving bed. We looked like quite the parade moving down the hallway with calculated speed. the fabric that we are made of. rush of saving a life, maybe it was simply the trip there, but either way, we all looked like we had just finished a marathon. However, the tough part of this race was about to begin. We moved her to the operating table. Yes, we skip the one and the two. Who has time for that? Only on TV do they bother with the whole one- two- three thing. During this whole process of moving Dorothy from the gurney to the OR table, by the way, I am trying to maintain an air of calm while in my head I am quietly rehearsing the ten thousand moves it will take me to perform this woman’s bypass surgery. All the while I am continuing to do chest compressions. The nurses begin to “prep me into the wound,” which means they pour Betadine, a dark bronze- colored skin cleansing agent, all over my hands, wrists, and forearms as well as the patient’s chest. It makes me look like I have just dipped my hands into a barrel of maple syrup up to my elbows. The nurses then drape the patient with sterile linens while bringing the drapes around my body so as not to drape me into the sterile field. Once the draping is done, I allow someone else who is now wearing sterile gloves to take over compressions while I run to the scrub sink to formally prep my hands. of the upper abdomen. My assistant and I each took an edge of sternum and pulled toward ourselves using our body weight as countertraction. Like breaking a wishbone, we pulled her sternum apart and placed a retractor along the sternal edge to hold the chest open. put their finger right through the heart. student, I was told that “if you’re not breaking ribs, you’re not doing it right.” Macabre medical humor noir, maybe, but the first time I did CPR as a medical student it was on an old man and I swear with my first compression I heard (and felt!) every rib snap like dry twigs underfoot. Eeeeew! You have no idea how grotesque that is. Open cardiac massage on the other hand is done with a firm but light touch like squeezing one of those “stress balls” in the palm of your hand. Great care is essential because you can, quite literally, rip a heart in two with your gloved hands. flow to the front and left side of her heart. The surgery went surprisingly well. Dorothy left the operating room in stable but critical condition. But would her body and mind recover from such a profound insult? Only time would tell. For the first few days she appeared to stabilize and do well. She awakened after two days of deep sedation and was able to communicate. Even though she remained on a ventilator and unable to speak, she “spoke” with those around her by nods and gestures. This, in itself, was nothing short of a miracle because when the heart is arrested, there is no blood flow to the brain and I half expected her not to regain consciousness at all. I spoke to her and told her what had happened and that it was amazing that she was even alive. She rolled her eyes and gestured with the palm of her hand on her forehead in an “I could’ve had a V8” mannerism as if to say that she knew she was in this predicament because she (and, sadly, her doctors) ignored the warning signs. were going to say before they mouthed the actual words. It was as if somewhere for them a clock had stopped. I could see it in their sullen eyes, their stooped posture, their wringing hands. I can always tell when a family is ready to let go. I am fully fluent in body language. who should live, but it is not for me to judge the situation so I must simply lay down my weapons of healing and trust the family. paraphernalia. She appeared human again. We made her comfortable by infusing a continuous drip of morphine, which we titrated as needed. We turned off the alarms on all of the monitors so as her blood pressure and heart rate softened, the family would not be jolted by an ear- piercing alarm that screams at everyone in the room, “I am dying! I am dying! Can’t you see?” We disconnected her from the dialysis machine but not the ventilator because I thought it might be uncomfortable for her to try to breathe on her own. Last, we turned off the medications that were supporting her blood pressure, the tube feedings, and all other medications except the morphine drip. I shut the outer door of her private ICU room to muffle any sound from other patients and staff in the unit. The only sound in the room was the whoosh of the ventilator that seems to whisper iiiiiinnnnn, ooooouuuuuttttt. In fact, if you say the word in while you are inhaling and say out while you are exhaling, it is exactly what a ventilator sounds like. Other than the ventilator, the only other sound in Dorothy’s room was soft sobbing. Mine and theirs. sixty seconds, but in the end, death came within sixty seconds. So when I say that a woman dies every sixty seconds from heart disease, it may just be the most horrific sixty seconds of her life and her family members’ lives. It’s hard to explain to your children why Mommy is frantically searching for her socks in the middle of a calm crisp Sunday afternoon. Why she is running to her car with her sneakers in her hand. Why she is speeding off with the flashers on. When I returned home later that day, having saved a life, I was greeted by a note on my front door from a neighbor who was “commenting” on the speed of my departure from the house. To say the note was nasty would be an understatement. I sat down at the kitchen table, noting the blood that had soaked through my canvas sneakers and onto my white ankle socks and mentally wrote an apology note to my neighbor explaining that I “just had to get to Blockbuster and pick up the latest release of Ferris Bueller’s Day Off before the store closed. My socks, my sneakers, and my rate of speed are immaterial to me as long as no one gets hurt. The “no one” that I am most worried about hurting, however, is my children. It is hard for them to understand the demands of our jobs, especially when we are called away suddenly. And so my husband and I, out of pure love for our children, have a special way of handling the head-on collision between our work lives and our home lives. We incorporate the kids, on some small level into our working world rather than isolate them from it. There are some parents who keep their work lives entirely separate from their home lives. When they are at work–they work. When they are home–there is no mention of work. And the two shall never meet. For us, this is impossible, and we have found that making the children feel like they are a part of what we do each day gives them the sense of belonging to part of a greater good. They get a sense of responsibility and a sense of control over the situation. They take ownership of what is happening rather than being victims of it. For an example, when my husband gets called in to do a liver transplant in the middle of the night, it invariably wakes up our five-year-old, Nicholas. (I could do an open heart surgery case in the middle of Gabriel’s room and he wouldn’t so much as roll over in his sleep.) My husband, Nick, will take the time to explain to Nicholas what he is doing. “Well, Tiger, there is sick patient who needs a liver transplant tonight. Right away. I have to get on a helicopter and go and get the liver.” I believe Nicholas thinks that donor livers come from stores and we have to fly to the store to get them because we haven’t yet told him that they come from dead people–a bit too much for a five-year-old. “What color is the helicopter?” Nicholas always wants to know details about what’s going on and I think this helps him to picture it better in his mind. “Tell me about the patient, Daddy.” Nick will talk about the patient in terms of what he does, where he lives, and what his family is like so Nicholas can get a sense of the person and not the disease. Nick and Nicholas will say a prayer for the patient so he has a “good operation” and “feels better.” So now, Nicholas knows where Daddy is going and why. He also feels like a part of the process because he believes, in a most sincere way, that his prayers will help this patient as much as Daddy’s surgical skills. Nick will also follow up with Nicholas to let him know how the patient is doing each day and Nicholas is delighted about being included in Daddy’s daily reports. On weekends, especially on days like Mother’s Day, when I seem to always be on call and have to make rounds (how I wish they’d invent a new holiday called Working Mother’s Day specifically for moms who work so we could have the day off), I often bring the boys to the hospital with me . This delights the nurses, who then ply them with apple juice, graham crackers, and Jell-O until they “spin” from the sugar high that they never get at home. “Don’t go to work today Mommy, please don’t go.” The words pierce my chest like a well-tossed javelin. “Do you want to go with me?” I say to my sons. “Sure.” Both of their little faces light up. We hold hands as we glide from room to room checking in on patients who are in various stages of recovery from heart surgery. I was examining the surgical incision of one particular patient when Gabriel asked, “What’s that?” pointing to the man’s chest. “It’s his incision, honey.” I replied. “it’s a crack-a-cision?” Gabriel asked. I thought about it for a moment. Well, of course, to a three-year-old, an incision would look like a crack in the body. It was his interpretation of what he was seeing and I just wen with it. You could see the gears turning in his head. He was trying to figure out how a pretty nasty-looking “crack” like that could actually make a person feel better. It looks more like a very painful, yet well-placed, lethal injury. And, yes, I admit that it is a bit strange that we, as heart surgeons, can violate the human body in such a grotesque way and actually improve a patient’s outcome. We heal by penetrating the chest and manipulating the core of our human physiology. How crazy is that? When we get to intensive care, Gabriel, a little shy, just wants to “see the bones,” and so I plop him down in front the X-ray viewing machine to look at the morning’s chest X-rays to his heart’s content. Nicholas, more adventurous, wants to “see the patients with the zipper” (referring to my sternotomy incisions). It amazes me how this little boy will walk right up to a patient lying in an ICU bed, with nine different tubes and hoses going into and out of his body, on a ventilator, completely unconscious, and touch his hand and whisper (so he “doesn’t wake him”), “Hope you feel better.” He’ll then smile at me proudly as if he has just cured the patient of cancer. He feels good. He feels proud. He feels like he has played a part in the patient’s healing. He is not filled with fear. He is filled with hope, as in “Hope you feel better” –his own words. His own contribution. Nicholas made a drawing of a robot and explained to me that this was a “healing robot” and “if you put it in Richard’s room, it will make him get better.” And so I did. I taped it to the blank wall in Richard’s room that he stared at every day, all day, and guess what? He got better. 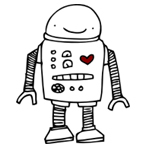 Sometimes I feel like a healing robot–a two dimensional piece of paper taped to a wall, not doing anything medically or surgically for patients but somehow, indirectly, helping them to get better. To heal them just by being there in their room. Kimberly was an amazing woman who cared deeply about everyone around her and thought little of her own well-being. Riddled with metastatic cancer, she would greet me each morning by asking me how I was feeling. I had a lousy cold. She had metastatic cancer. 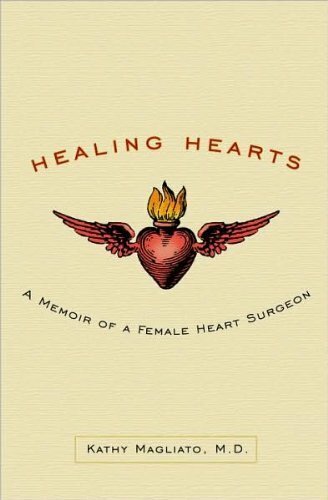 Fluid had accumulated around her heart, known as a pericardial effusion, which had been surgically drained. Every day I would check the drainage tube that had been left in place to see how much it had drained overnight. The tube needed to be removed in order for her to go home–to go home to die. This damn tube held her hostage at the hospital because it kept draining liters of fluid. Two days before she died, I went to see her and she did not look good at all. She was ashen, slumped in her chair and her dark, dank hair hung limp around her face. Her breathing was labored and shallow. “How do you feel today?” she asked me as always, except that her words were more feeble and breathless. “I feel like we should move to intensive care today, that’s how I feel,” I replied, which made her chuckle. I just smiled at her wryness. She used to be a comedian and I suppose that humor was the last vestige of her life that she had left. She had carried the torch for two clocks of its cross-country journey in the 1984 Olympics and this was last leg of her race. The day she moved to the ICU was the day she officially became my sickest patient on rounds. It was also the day that Nicholas drew her a healing robot. Actually, it wasn’t a healing robot per se; it was a healing rainbow. Nicholas drew a beautiful picture of the sun and a rainbow. When I asked Nicholas why he drew Kimberly a rainbow instead of a robot, he replied, “Because Kimberly needs to go over the rainbow to get better.” Now, mind you, Nicholas knew nothing of this woman’s grave illness and the fact that she was about to die. I found that rainbow deeply prophetic. The following morning, rainbow in one hand, Scotch tape in the other, I went to Kimberly’s room in the intensive care unit. Her son was asleep on a cot next to her bed. He was wearing headphones and was breathing the soft, comfortable, evenly paced breath of someone fast asleep. Kimberly was in a rumpled hospital bed with the side rails pulled up. Her face was partially obscured by an oxygen mask. Unlike her son’s breathing, her breath was agonal and came in spurts. Ling, slow breaths followed by pregnant pauses. Although it was a beautiful Southern California morning, none of the day’s sunlight seemed to pas through the window of Kimberly’s room, although I can’t quite explain why. In one corner of the room lay her and her son’s personal items stuffed into four plastic hospital bags. They had simply been stacked in the corner and hadn’t been put away, as if the move from her other room on the regular ward was a hurried one. Perhaps it was. Kimberly opened one eye and, with a weary look, took notice of my taping up the picture. I told her that my son had drawn her a healing rainbow. She didn’t hear me or at least didn’t acknowledge she had. It didn’t matter. I taped it high enough on the wall across from her bed so it would be at eye level if she opened her eyes. She never did. As I turned to leave the room, having done nothing medically or surgically to help Kimberly, her son awoke. Half asleep, he poured himself into a chair nest to the side of his mom’s bed. His movements were slow and well rehearsed as if this is what he did upon waking every morning. He looked at his mom awash in sickness and tried to get closer to her by leaning over the bed rail and placing his arm around her head to cradle her in its crook. He didn’t notice me standing there, the two-dimensional healing robot, doing nothing–until I spoke. “Do you want to get in bed with your mom?” I asked. “Is that possible?” he said, a bit bewildered. I called the nurse in, an exceptionally kind nurse indeed, and together she and I gently moved Kimberly to the far side of the hospital bed to make room next to her for her only son. He was a strapping young man in his twenties, yet gently, so very gently, he climbed into bed next to her. I raised the side rail on his side of the bed, pulled the covers over the two of them, and turned out the lights. He cuddled her with both arms wrapped around her body and her head rested against his chest just the way I cuddle my sons when they sneak into my bed in the wee hours of the night. Within three minutes of settling in next to her son, Kimberly took her last breath and died in his arms. It was as if she had waited for him to get into bed nest to her before she left the earth. Although I was just a healing robot and did nothing to help this woman medically, at least I gave her that–a beautiful release from her illness, a beautiful exit from this world. When it’s my time to go, that’s how I want to die. In the arms of my son. “How did Kimberly like my picture?” Nicholas asked when I got home that evening. 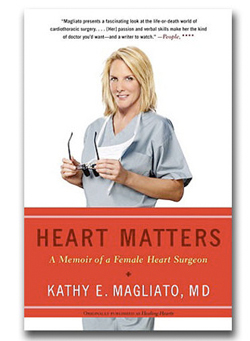 From the book HEART MATTERS by Kathy Magliato, published by Broadway Books, an imprint of the Crown Publishing Group, a division of Random House, Inc. Reprinted with permission.